On This German Island, The Breakers Bring Gifts Ashore: Thousands Of Toys : The Two-Way You might say something eggstraordinary (sorry) happened on the North Sea island of Langeoog. 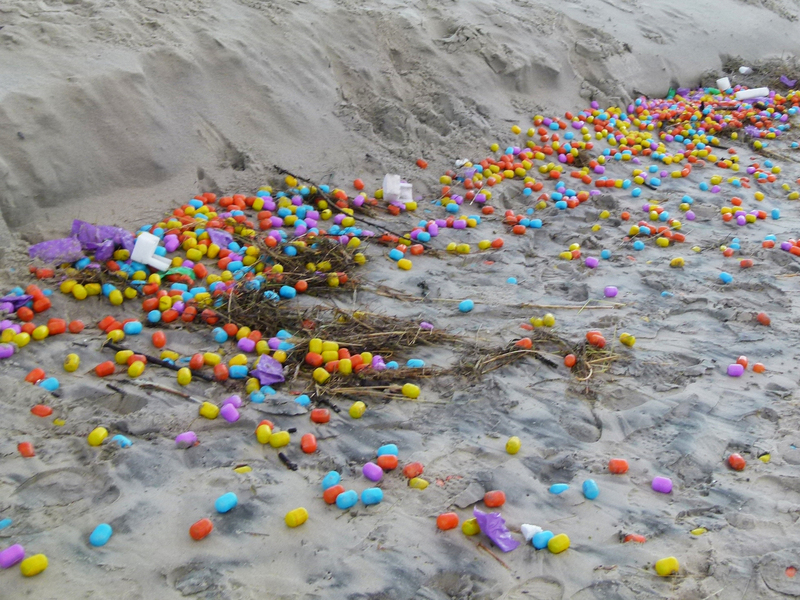 Tens of thousands of little eggs containing toys washed ashore there, much to the delight of local kids. Thousands of plastic eggs have washed up on the beach on the German island of Langeoog. It's a fantasy that goes back centuries: a message in a bottle, carried ashore from far-off lands. Authors, artists and children alike have dreamed of such a gift from the sea. This time, though, it's not a bottle that washes ashore. It's eggs — thousands of little toy eggs. That's what happened on the German island of Langeoog this week. Perched just off the North Sea coast, it found itself buffeted by an invasion of multicolored plastic eggs — much to the delight of local children, because the eggs contained toys. Police for the Lower Saxony region of Germany tweeted the evidence. Der Spiegel reports that police suspect the eggs came from a freighter that lost part of its cargo during an intense storm, which the BBC calls the worst to hit Germany's northeastern coast since 2006. At any rate, what was lost now has been found, by many of the community's littlest residents. The local mayor, Uwe Garrels, soon allowed the town's local kindergartners to go pick up the toys, according to Deutsche Welle. "The surprise eggs have found their way to freedom," Garrels said, according to the news service, which cited broadcaster NDR. Of course, the joy of the moment wore off soon. Still, all these little eggs contained an extra treat with their toys. Like the immortal bottle, they bore notes from afar. There was just one problem for the German children who received them: They were written in Russian. A previous version of this post misspelled the name of the German island Langeoog as Langegoog.